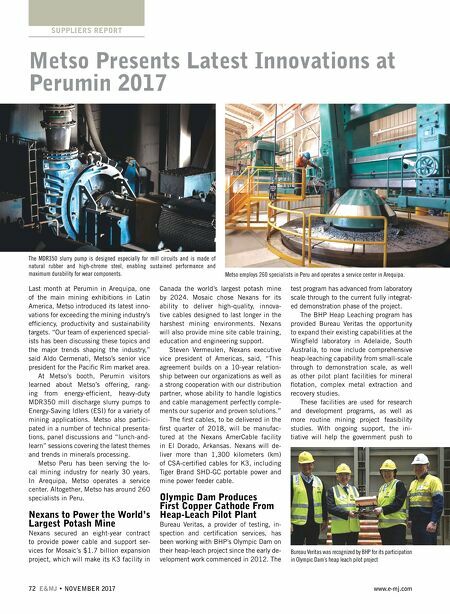 NOVEMBER 2017 • E&MJ 73 www.e-mj.com SUPPLIERS REPORT achieve their objective of promoting South Australia as a preferred hub for copper and other mineral development opportunities. 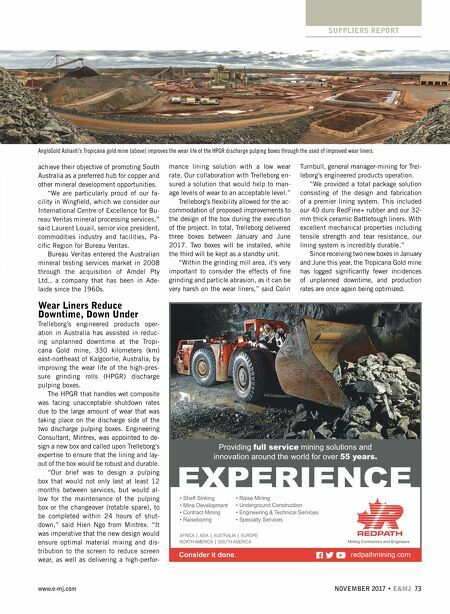 "We are particularly proud of our fa- cility in Wingfield, which we consider our International Centre of Excellence for Bu- reau Veritas mineral processing services," said Laurent Louail, senior vice president, commodities industry and facilities, Pa- cific Region for Bureau Veritas. Bureau Veritas entered the Australian mineral testing services market in 2008 through the acquisition of Amdel Pty Ltd., a company that has been in Ade- laide since the 1960s. Wear Liners Reduce Downtime, Down Under Trelleborg's engineered products oper- ation in Australia has assisted in reduc- ing unplanned downtime at the Tropi- cana Gold mine, 330 kilometers (km) east-northeast of Kalgoorlie, Australia, by improving the wear life of the high-pres- sure grinding rolls (HPGR) discharge pulping boxes. The HPGR that handles wet composite was facing unacceptable shutdown rates due to the large amount of wear that was taking place on the discharge side of the two discharge pulping boxes. Engineering Consultant, Mintrex, was appointed to de- sign a new box and called upon Trelleborg's expertise to ensure that the lining and lay- out of the box would be robust and durable. "Our brief was to design a pulping box that would not only last at least 12 months between services, but would al- low for the maintenance of the pulping box or the changeover (rotable spare), to be completed within 24 hours of shut- down," said Hien Ngo from Mintrex. "It was imperative that the new design would ensure optimal material mixing and dis- tribution to the screen to reduce screen wear, as well as delivering a high-perfor- mance lining solution with a low wear rate. Our collaboration with Trelleborg en- sured a solution that would help to man- age levels of wear to an acceptable level." Trelleborg's flexibility allowed for the ac- commodation of proposed improvements to the design of the box during the execution of the project. In total, Trelleborg delivered three boxes between January and June 2017. Two boxes will be installed, while the third will be kept as a standby unit. "Within the grinding mill area, it's very important to consider the effects of fine grinding and particle abrasion, as it can be very harsh on the wear liners," said Colin Turnbull, general manager-mining for Trel- leborg's engineered products operation. "We provided a total package solution consisting of the design and fabrication of a premier lining system. This included our 40 duro RedFine+ rubber and our 32- mm thick ceramic Battletough liners. With excellent mechanical properties including tensile strength and tear resistance, our lining system is incredibly durable." Since receiving two new boxes in January and June this year, the Tropicana Gold mine has logged significantly fewer incidences of unplanned downtime, and production rates are once again being optimized. Mining Contractors and Engineers AFRICA | ASIA | AUSTRALIA | EUROPE NORTH AMERICA | SOUTH AMERICA • Shaft Sinking • Mine Development • Contract Mining • Raiseboring • Raise Mining • Underground Construction • Engineering & Technical Services • Specialty Services redpathmining.com Consider it done. EXPERIENCE Providing full service mining solutions and innovation around the world for over 55 years. AngloGold Ashanti's Tropicana gold mine (above) improves the wear life of the HPGR discharge pulping boxes through the used of improved wear liners.